Boston Rugby Club went down 43-0 at league leaders Loughborough on Saturday. The result sees the Blue and Whites sitting in 10th place in the Midlands 3 East (North) standings, with just Sleaford and Nottiungham Moderns below them. Loughborough and Boston couldn’t be in more contrasting form, with the hosts recording their 10th win in a row and Boston suffering their eighth straight defeat in the league. In fact, Loughborough have won all of their 13 matches apart from a 31-27 reverse at Boston in September. The Blue and Whites will now host Nottingham Moderns at the Boardsides on Saturday (KO 2.15pm). Boston’s Development side earned a 38-13 against Skegness Seconds in the Merit League. The hosts started brightly but when they knocked the ball on just outside the away side’s five it seemed like good play had gone to waste. 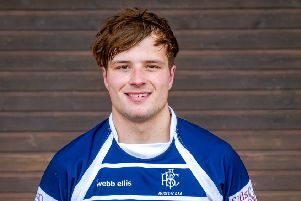 But an overpowering scrum with great hooking from George Sharp made it easy for captain Joe Deamer to take the ball and charge over. The second try came soon afterwards as Boston earned a line-out from a penalty, which was brought down well and the resulting maul travelled some distance before being shipped to Harry Woods to finish off a great move by the backs. The third try came as Deamer again picked up and secured the ball which was played out excellently by Joradache Stones-Blackman, leaving centre Chris Kellock to break through the gap and finish the move in style. Flanker and man of the match Tom Andrews converted the try to make it 17-0. The game came alive again after a line out broke loose within the opposition half and great reactions from Sharp saw him charge along the touchline. This gave plenty of room for Kellock to run through the Skegness back line and an offload by centre Jordan Cleaver set up Harry Woods in bags of space to put it beneath the posts. From a penalty, Deamer took a lethargic Skegness defence by suprise to dart over the line for his second of the day. Andrews converted his third to make it 31-0 before Skegness had the final say of the half by kicking a penalty. Boston conceded two tries within the first 10 minutes of the second half, leaving the score at 31-13. But they got their act together, despite James Richardson having to make a recovering tackle to half a Skegness breakaway. A final try did come 10 minutes before time as the pack dominated a scrum. The ball was played to Cleaver, who cut through the Skegness defence to cap off a great win.